The Battle of Flirey (French: 1re Bataille de Flirey) was a First World War battle fought between the 19th of September and 11th of October 1914. 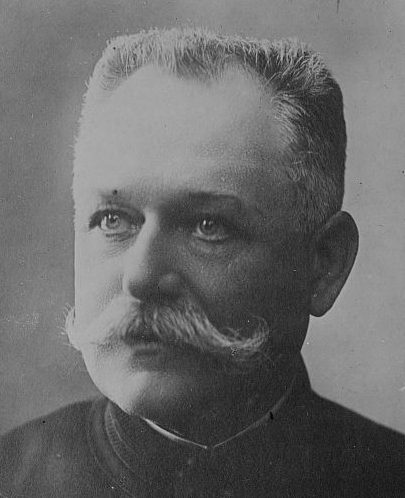 It resulted in a German Army victory against the French Army. The battle cut most of the roads and railways to the strategically important fortified city of Verdun, and was to have a large effect on the course of the war. The Woevre Plain stretches from the city of Luxemburg, south to the French city of Toul, and was a common route of attack between Germany and France. The plain is flanked on the eastern side by a series of mountain ranges (the "Hauts de Meuse") alongside the Meuse River, and along the western side by the a series of mountain ranges alongside the Moselle River. Pre-war, a series of German fortifications were build along the Moselle River (especially around the city of Metz), while across the boder, a matching set of French fortifications was established along the Meuse River around Verdun and Toul. 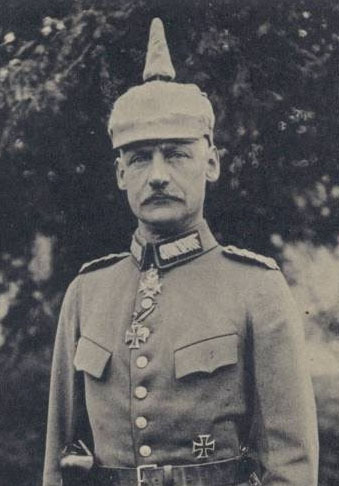 In the first months of the First World War, the German High Command were the first ones to realise the increased effectiveness that artillery and machineguns gave to the defense, and as a result seized various terrain features that would be easy to defend. As a result, recognising that it is easier to defend the heights alongside the Meuse River (as opposed to the plain between the Moselle and Meuse rivers), a German attack was planned to seize these heights, and so deny access to the Woevre Plain to the Allies. In addition, this would isolate the fortified city of Verdun and reduce the ability of the French to attack German territory. The attack commenced on the 19th of September, with German cavalry from Metz skirmishing with the French defenders in the Dieulouard - Martincourt area. Flirey, the woods around the village and Seicheprey were quickly captured. French reinforcements arrived on the 22nd, but could not stop the Germans from advancing. The German advance then changed direction, moving from the previous southerly direction, to a south-westerly direction. By September 24th, the village of Saint-Mihiel was captured, despite the french villages of Flirey, Seicheprey and Xivray being recaptured. More French reinforcements arrived on the 27th, but as the Germans were now firmly entrenched, French counterattacks (between Flirey and Apremont) resulted in little change in the front line. 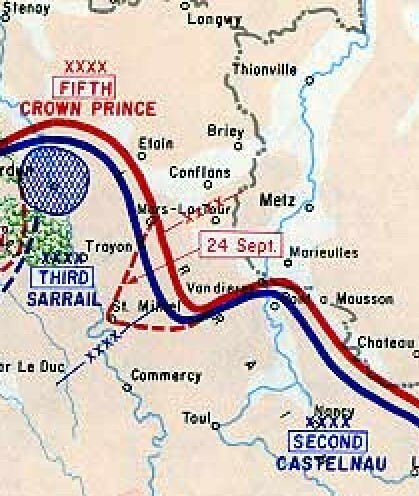 French counter attacks continued until October 11. The battle resulted in a salient (the "St. Mihiel Salient") being projected into the french lines south of Verdun. Of the two roads and one railway that led to Verdun, the battle resulted in all bar one minor road being rendered impassable by the Germans. This imposed a serious logistical handicap to the french defenders around Verdun. In addition, it resulted in Verdun being encircled on three sides, and effectively neutralised Verdun as a base to any French offensives. The area was to see much fighting over the rest of the war. However, despite numerous attempts by the French to reduce the salient (such as the First Battle of Woevre and the First and Second Offensive Battle of Verdun), the salient wasn't reduced until the American/French attack in September 1918 (the Battle of Saint-Mihiel).